Clutterbucks Gritting provides a winter gritting and snow clearing service covering the South East,Surrey, Kent, Sussex, London, Gatwick, and Crawley. Clutterbucks Gritting operates with Nurture Landscapes Ltd providing a National network with local operators, delivering across the UK for commercial, public and private premises. 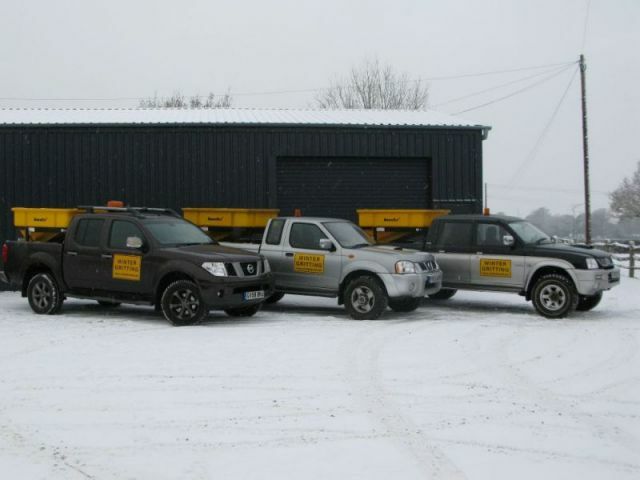 We offer a personally tailored reliable service specialising in ice control and snow clearance on roadways, business premises and public car parks. Operators are fully trained,all vehicles are fitted with reversing cameras and alarms. Salt applications are carried out using mechanised spreaders to give even coverage at an optimum rate to control prevailing weather conditions. We also hand spread pathways and steps and will provide, site and fill grit bins. Clutterbucks Gritting is an accredited member of SAFEcontractor and has public liability cover up to 10 Million. All our drivers are fully trained and HSE Passport Holders. We provide a personal service to meet your Health and Safety requirements, supplying 24 hour cover 7 days a week throughout the winter(1st Nov-31st Mar) operating mainly between 6pm and 8am to minimise disruption to your business. We provide flexible callout liasing with your facilities manager or security on a daily basis during periods of high risk ensuring we only grit when necessary. Weather risk is monitored using MetDesk Roads Business Critical Weather Services, this service provides highly detailed, location-specific weather reports which allow us to grit proactively during the night and early hours of the morning when most sites are clear of vehicles and pedestrians.